Revolt! Rise up looking ravishing in this memorably mutinous top by Ferre Jeans. Horizontally striped pattern. Crew neck outlined in a solid color with a V at the center front. A seam runs diagonally from the neck to under each arm on the front and back. Long sleeves with solid colored cuffs. 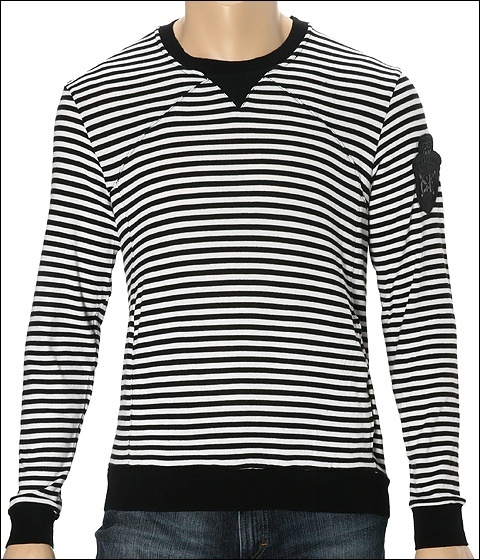 Left sleeve has a Ferre Jeans logoed patch. Kangaroo pockets. Solid colored banded bottom hem. 57% nylon and 43% rayon. Final touches: 80% cotton and 20% elastane. Hand wash cold and line dry. Made in Italy.